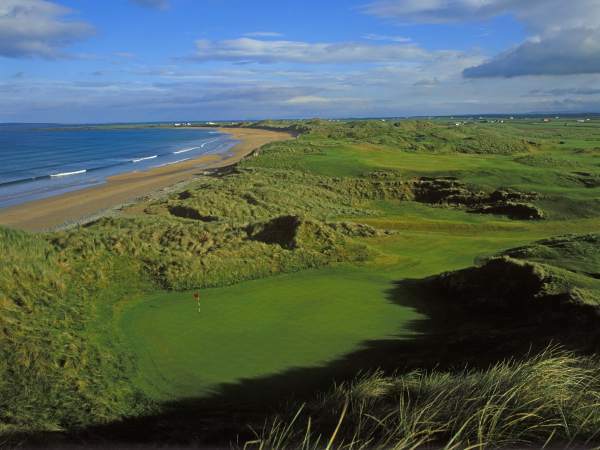 Doonbeg Golf Club plays along 2km (1.5 miles) of beach and dunes. 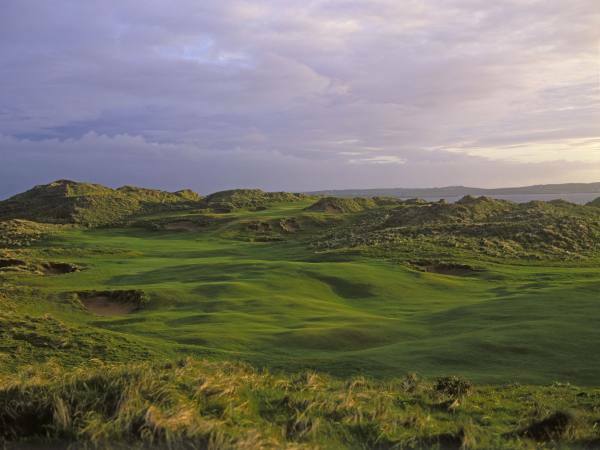 The ocean is visible from the green, fairway, or tee on 16 of the 18 holes and the golfing adventure embarked upon by the villagers of Doonbeg on Clare's Atlantic coast, is set to gain a new dimension with the opening in May 2006 of an imposing new hotel, The Lodge. 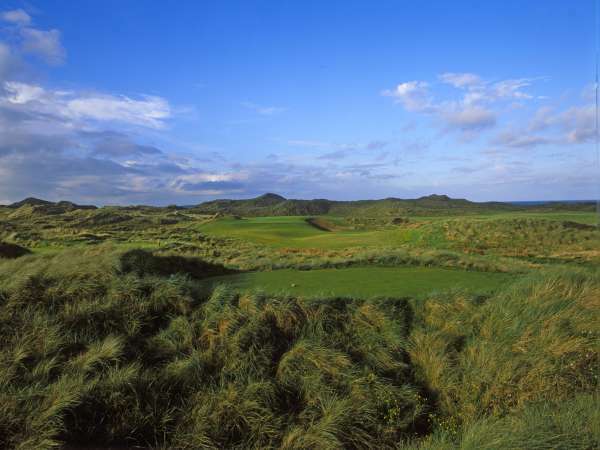 Further afield, its name will pop automatically into people's minds when they talk about the design skills of Greg Norman who said "I have designed the course around the 15th hole, a magnificent par four of 440 yards to a funnel-shaped green surrounded by the highest dunes on the course. Landing a ball on the front edge of the 150-foot-long green, and wondering if it will stop before running off the far end [into perdition], is far more of a challenge to me than the target golf of hitting behind the flagstick from 187 yards and spinning it back six inches." Yet the Shark was forced to settle for an out-and-back layout rather than a desired two loops of nine, because of the presence of a minute snail called Vertigo Angustior. So, the most extreme point of the 6,885 yard layout, which sits alongside Doughmore Bay, is the 10th tee. Meanwhile the homeward journey includes the delightful, 111-yard 14th, overlooking the Atlantic and where the tee-shot can vary from sandwedge to long iron, depending on the wind. Not unlike the famous, short seventh at Pebble Beach. "This is a course I want to be identified with, one I will be able to say with pride - 'I did that one.' I am the luckiest designer in the world . . . because of the uniqueness of the site" - Greg Norman.
" 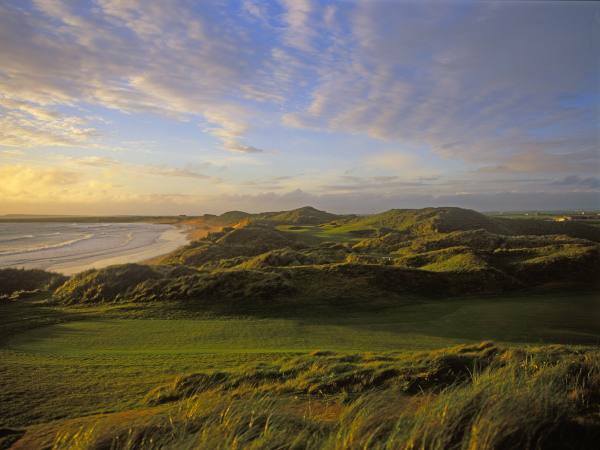 /> Doonbeg Golf Club plays along 2km (1.5 miles) of beach and dunes. 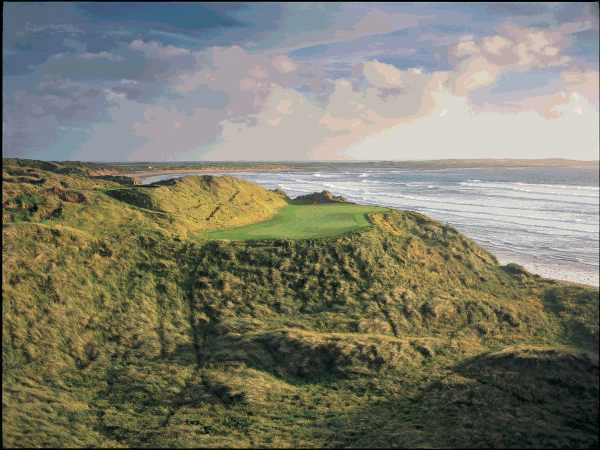 The ocean is visible from the green, fairway, or tee on 16 of the 18 holes and the golfing adventure embarked upon by the villagers of Doonbeg on Clare's Atlantic coast, is set to gain a new dimension with the opening in May 2006 of an imposing new hotel, The Lodge.